Tackle applications with utmost confidence using field-proven tools for analyzing, locating, measuring, reading and verifying. Harness the full power of today’s hardware through optimizations exploiting SIMD, multi-core CPU, multi-CPU, GPU2 and FPGA technologies. Obtain live images from the interface of choice through support for analog, Camera Link®, Camera Link HS, CoaXpress®, DVI-D, GigE Vision®, IEEE 1394 IIDC, SDI, and USB3 Vision™ 2,3 transmission formats. Maintain flexibility and choice by way of 32-bit Windows® XP, 32/64-bit Windows 7/8.1/10, 32/64-bit Linux®, and RTX643 (RTOS) support. Make the best use of available programming know-how with support for C, C++, C#, CPyhton3 and Visual Basic® languages. Increase productivity further and reduce development costs by receiving training and assistance from our team of imaging experts. 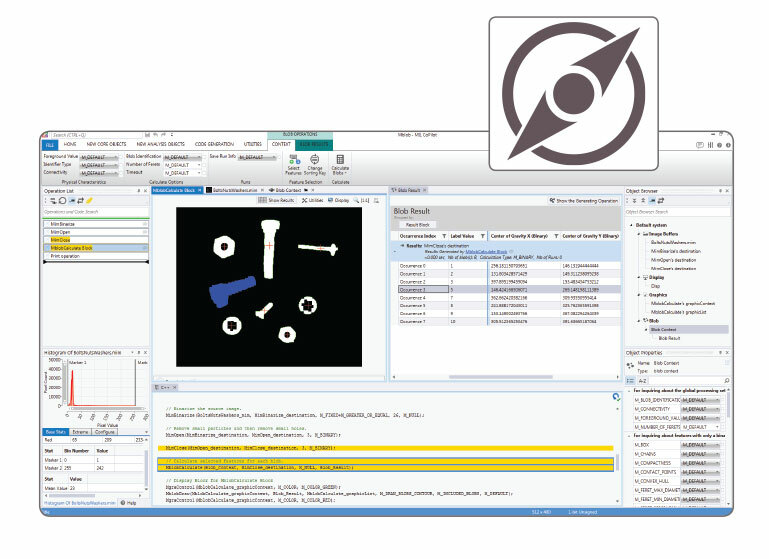 Accessible to MIL is an interactive environment to facilitate and accelerate the evaluation and prototyping of an application. The same environment can also initiate and therefore shorten the application development process through the generation of MIL program code. Running on 64-bit Windows®, MIL CoPilot provides interactive access to MIL processing and analysis operations via a familiar contextual ribbon menu design. 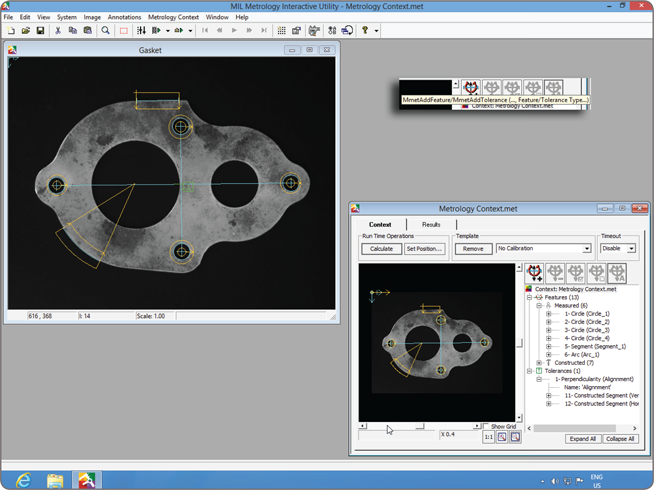 It includes various utilities to study images and help determine the best analysis tools and settings for a given project. Applied operations are recorded in an Operation List, which can be edited at any time. 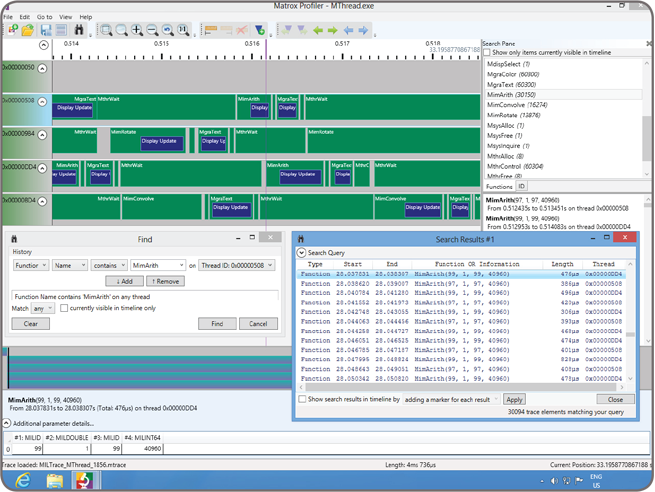 An Object Browser keeps track of MIL objects created during a session and gives convenient access to these at any moment. Non-image results are presented in tabular form and a table entry can be identified directly on the image. The annotation of results onto an image is also configurable. Once an operation sequence is established, it can be converted into functional program code in any language supported by MIL. Program code can be packaged as a Visual Studio® project, which in turn can be built and executed without leaving MIL CoPilot. Bundled with MIL is Matrox Inspector, an integrated imaging environment for 32-bit Windows®. Matrox Inspector provides an easy-to-use interface with point-and-click access to MIL image capture, processing, analysis, and archiving operations. MIL-Lite is a subset of MIL. 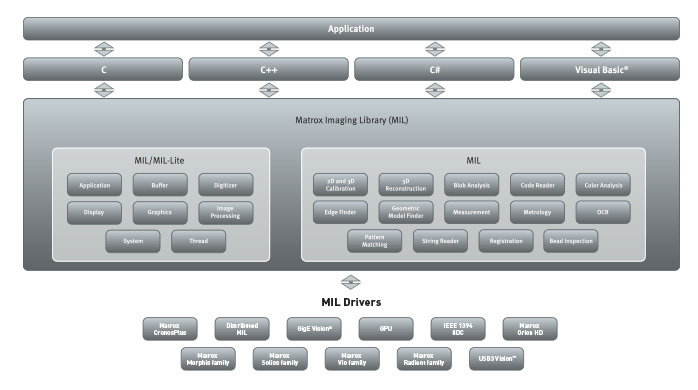 MIL-Lite features programming functions for performing image capture, annotation, display, and archiving. It also includes fast operators for arithmetic, Bayer interpolation, color space conversion, de-interlacing, temporal filtering, basic geometric transformations, histogram, logic, LUT mapping, and thresholding. MIL-Lite is licensed for both application development and deployment in the presence of Matrox Imaging hardware or a supplemental license tied to a dongle. An experienced and skilled technical support group helps users with installation, interoperability and programming matters. Matrox Imaging also offers the assistance of the Vision Squad. The Vision Squad’s knowledgeable staff, working closely with MIL tool developers, helps MIL users quickly assess application feasibility and establish the best strategy for using MIL processing and analysis tools to produce a solution. Services range from providing advice to delivering a proof-of-concept imaging application and even its underlying framework.